There are few games in today’s market that are geared towards creating a fully customizable social experience where a player could be playing CTF in space one moment, and having simulated drinks at a bar with Goku and Master Chief the next. Such are the goals of VRChat Inc. the creator and publisher of the game VRchat. The game was made available on February 1 last year via Steam, receiving mostly positive reviews linked to the game customization and seemingly nonsensical gameplay. Being an industrious lot the PC modding community was quick to begin building worlds and character models for VRchat, expanding the game’s content by leaps and bounds. Unfortunately the game was slow to build its player-base and by summer of last year, VRchat was averaging around fifty players on any given day. It’s unclear as to why the game has received a sudden spike in popularity (now averaging around 16000 players online at the time of writing) but the militarization of alleged Ugandan forces might have something to do with it. Ugandan Knuckles is a shrunken, lumpy looking version of Knuckles the Echidna from Sega’s long running Sonic the Hedgehog franchise. Make no mistake, the appearance of this character model is the only similarity that Ugandan Knuckles shares with its authentic counterpart. The original creator if this character model goes by the username tidiestflyer who uploaded the design to DeviantArt sometime late last year. At the time, tidiestflyer just wanted to make something funny and meme-like, and was unaware of how this would change the landscape of VRchat for the foreseeable future. It took a few weeks for the meme to catch on but once it did there was no stopping it. 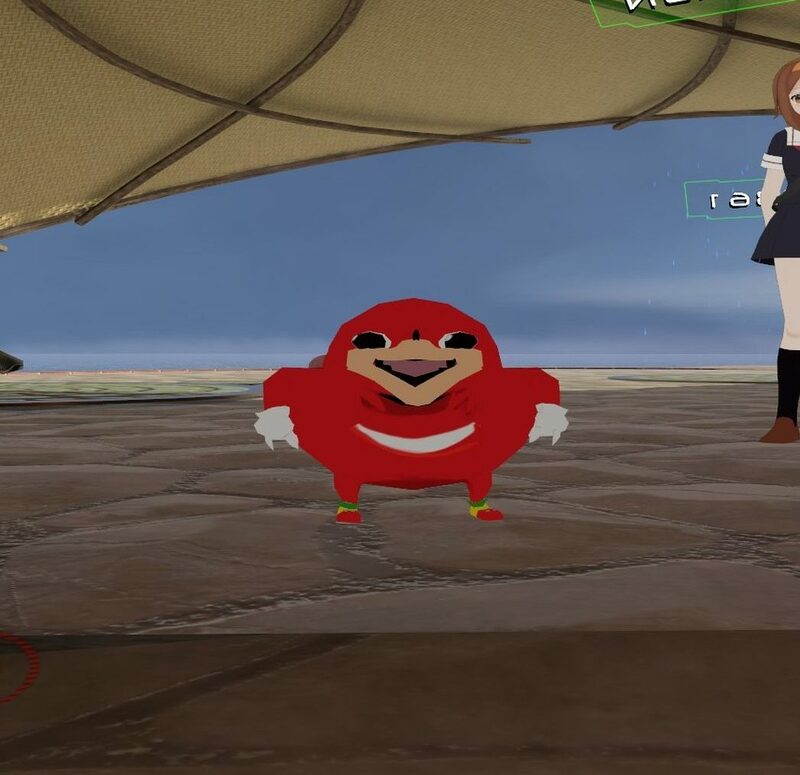 Similar to the Habbo Hotels “Pool’s Closed” raids which took place back in 2006, the character model of Uganda Knuckles has begun popping up everywhere the public rooms of VRchat. At a moment’s notice lobbies with eight players could burst into parties of 32, the bulk of users taking on this Ugandan persona. Being that VRchat is a free-to-play game, it allows anyone with a half decent computer to create an account and join these raids (that’s right, you don’t need a VR headset in order to play VRchat). By late 2017, VRchat was averaging just under 6000 players online at any given time. The meme itself is undoubtedly stupid and racist, but admittedly quite humorous. An encounter with a Ugandan Knuckles will predictably entail a group of them asking you the question “Do you know the way?” in a heavily forced accent. If you do not “know the way,” there’s a chance it might spit on you. If your avatar happens to be an anime girl then you have a shot becoming their queen. The sole purpose it seems for these formidable little things is to “find the way,” “find the queen,” “protect the queen,” and “conquer enemy land.” While the base character model is still very popular, there have been variants which further exaggerate the already silly aesthetic. Is the Uganda Knuckles meme the sole reason as to why VRchat received a sudden boom in popularity? Probably not, but it certainly has brought the game attention. Uganda Knuckles has gone from an obscure loopy character model to a fully-fledged, ritualized identity inside the virtual space of VRchat — an identity that is likely to influence an ever-growing community of players. If you’d like to try VRchat for yourself, you can check it out on Steam. Embedded below is a video that exhibits the essence of the such raiding. Detective Pikachu Is On The Case!